The new Sony 8-megapixel super zoom digital cameras DSC-H9 and DSC-H7 are designed to appeal to families with budding athletes in their broods with Sony’s new advanced sports shooting mode. The sports shooting mode combines high shutter speed shooting and intelligent continuous auto-focusing. This predictive technology also helps to reduce shutter lag, the time it takes for the camera to focus and shoot. 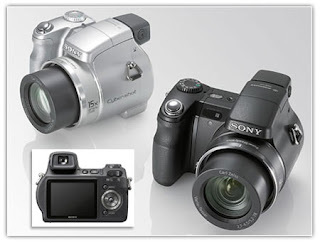 Both cameras Sony DSC-H9 and DSC-H7 feature powerful Carl Zeiss 15x optical zoom lenses for up-close shots of big plays on the field .Both cameras are powered by the Bionz processing engine, first used in Sony’s Alpha digital SLR camera system. This new circuitry speeds up response times and delivers the fast image processing speeds needed to produce color-rich, detailed pictures for true high-definition photo viewing. The Sony H9 and H7 cameras incorporate Super Steady Shot optical image stabilization to minimize blur caused by camera shake. Their high sensitivity, up to ISO3200, also helps to fight blur resulting from fast-moving subjects. The H9 camera takes fast-action shooting a step further. It sports a 3-inch, flip-up LCD screen so that you can shoot comfortably from nearly any position. The H7 camera has a non-articulating but large 2.5-inch LCD screen for easy sharing and viewing. The Sony H9 camera is the only Cyber-shot model in this year’s line to feature NightShot technology. This feature allows you to take photographs in environments with virtually no light so you won’t miss the action, even at a late night game. The Sony DSC-H9 and DSC-H7 cameras will ship in April for about $480 and $400, respectively.